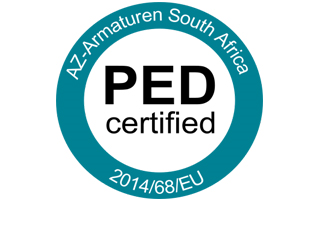 The South African valve manufacturer AZ-Armaturen South Africa (Pty) Ltd has been successfully certified according to the Pressure Equipment Directive (PED) 2014/68/EU – Module H.
This is a great achievement for the South African production plant of the AZ-Armaturen Group. Valves manufactured by AZ-Armaturen South Africa which are in accordance with the PED requirements, can now be affixed with the internationally recognised “CE” mark. The Pressure Equipment Directive regulates the manufacturing of Pressure Equipment such as pressure vessels, piping, and valves within the European Union. Globally, PED has become the most recognised standard for pressure equipment. The certification to Module H refers to a Full Quality Assurance System including the design of the Valves under the scope.